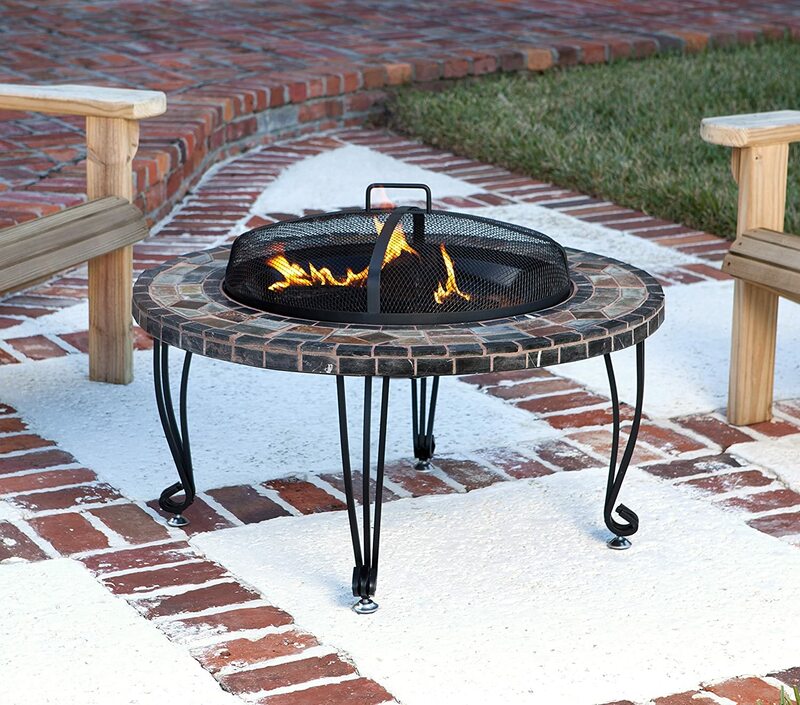 Are you planning to add a fire pit to your backyard? Did you know that this will not only keep your warm but will surely be a great addition to your garden’s decoration? 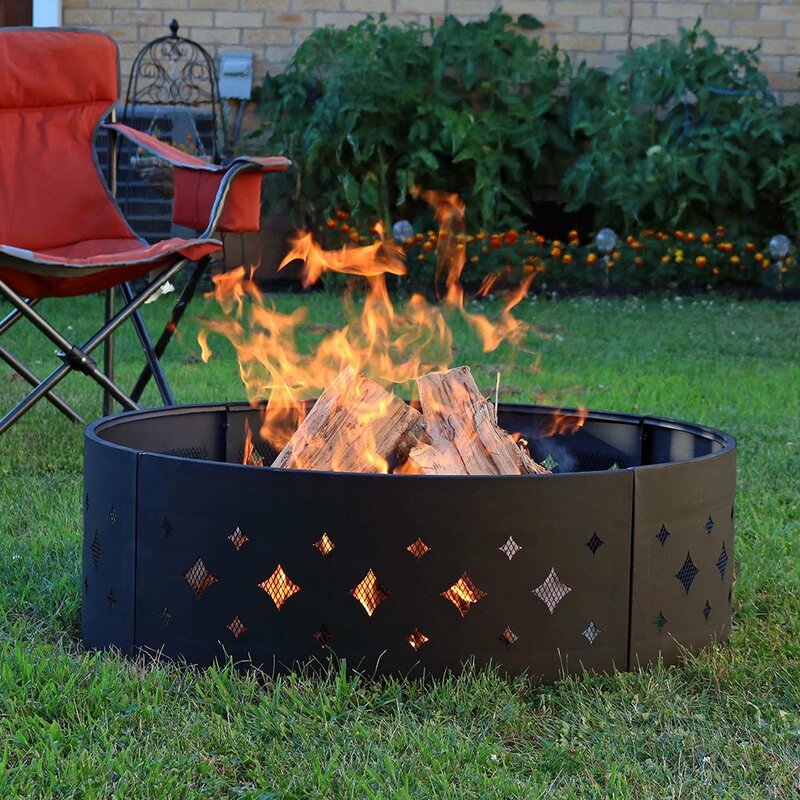 The knowing the best fire pit that you can add to your yard is essential. Staying outdoors to watch the stars at night with your loved ones can be relaxing, but this won’t be the case if it’s chilly outside. This is where the fire pit will come to your rescue since it will keep you and the people around you warm, which will make you enjoy the outdoors more. Now if you are thinking of purchasing a fire pit, then knowing how to choose the best fire pit available in the market is essential. In this way, you will be able to make the most out of your fire pit. Here are some of the tips that you need to consider before purchasing a fire pit for your backyard. Of course, the first thing that you need to do is to know the budget that you are willing to shed out for your fire pit. The best thing that you can do is go to a showroom for you to know which one suits your budget best. You also need to check your backyard if you have enough space for a big fire pit or just a smaller one. You can start planning and visualizing everything before purchasing the fire pit. You need to make sure that your backyard won’t look too crowded if you add a fire pit to it. Since there are a lot of fire pits in the market today, they all come in different styles. It may be hard for you to choose what style suits your backyard best. Some of the most popular fire pits today are square and fire bowl versions that look like tables that are low. If you want your fire pit to be moved easily, then choosing the bowl one would be ideal. But for people who have a lot of rooms in their backyard, then a square pit that is stationary would be perfect. Fire pits’ sizes can range from 20 inches to 45 inches in diameter, though the smaller ones can range from 20 inches to 25 inches in diameter. If you want larger pits than they usually measure 40 inches to 45 inches in diameter, which is similar to the size of an outdoor table. For compact patios and decks, a small fire pit would be ideal to avoid the pit from eating too much space. Since fire pits can use propane, gas, or even a wood burning one, it would be best to decide on which type you will choose. A wood fire is one of the most cost-efficient since you can easily get woods. But you should know that they smell, and they will look like a campfire in your backyard. If you can take up the smell and the campfire look that it has, then, by all means, choose the wood fire. There are different materials used to create different fire pits, including copper, stainless steel, tile, and even stone ones. Stone is the heaviest, which is perfect for backyards that have enough space. Stainless steel, on the other hand, are pricey but is resistant from rust and rain, but very easy to clean. Copper fire pits are the standard version of all, wherein they are powder coated and can stand up to any elements. They even have shiny looks, which can be a great addition to your backyard. These are the things that you need to consider when purchasing a fire pit for your backyard. These tips will help you know the right fire pit to choose. Of course, now that you know how to purchase one, it would be best to know the benefits of having one for your home. Having a fire pit in your backyard is nice for you and your family can comfortably gather there. Being outdoors is fun since you can be with nature. You can even spend dinner around the fire pit while bonding with your family and friends. No matter how chilly the weather is, you will be assured that you and your family will be able to feel warm with your fire pit. Another good thing about having a fire pit is that your backyard will look more pleasing. It will add an aesthetic touch to every backyard, especially if installed in the right spot. You can also match your other furniture to the look of your fire pit, just make sure that they are resistant from rain and other elements. Lastly, a fire pit will let you cook the food over the fire. You can start toasting marshmallows and other food, which will be a fun activity for you and the family. You can grill as well using the fire pit, just make sure to purchase a grill gate so that you can cook corn cobs, meats, and other types of food. There are other cooking accessories for fire pits, which you can use to cook for pancakes and soup. Now that you know the different benefits of having a fire pit, it would be ideal to know the best fire pit available in the market today. There maybe a lot but the following fire pits below will help narrow down the options that you have. 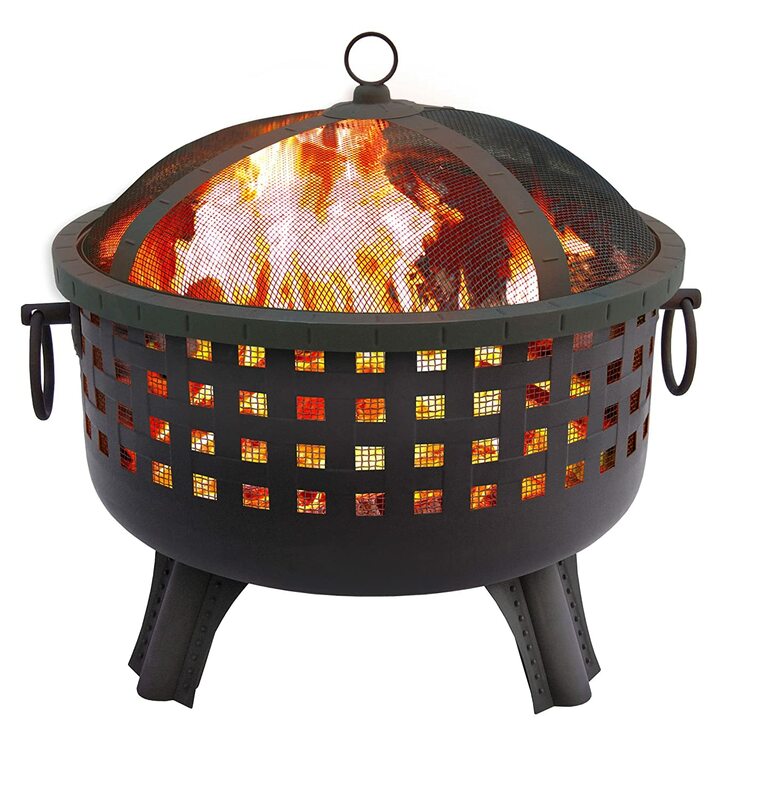 Landmann 26464 23 Inch Savannah Garden Light Fire Pit has a 23.5 inches in depth, which makes it the deepest and largest fire pit in the market today. It comes with screens on the sides to ensure that the embers are inside the pit. This means that you will surely stay safe even if you are near the fire pit itself. Despite its large size, it only weighs 2 pounds or even less. The Sandman Savannah Garden Light can also provide a 360 degree for you and your family to enjoy its warmth while enjoying the outdoors. 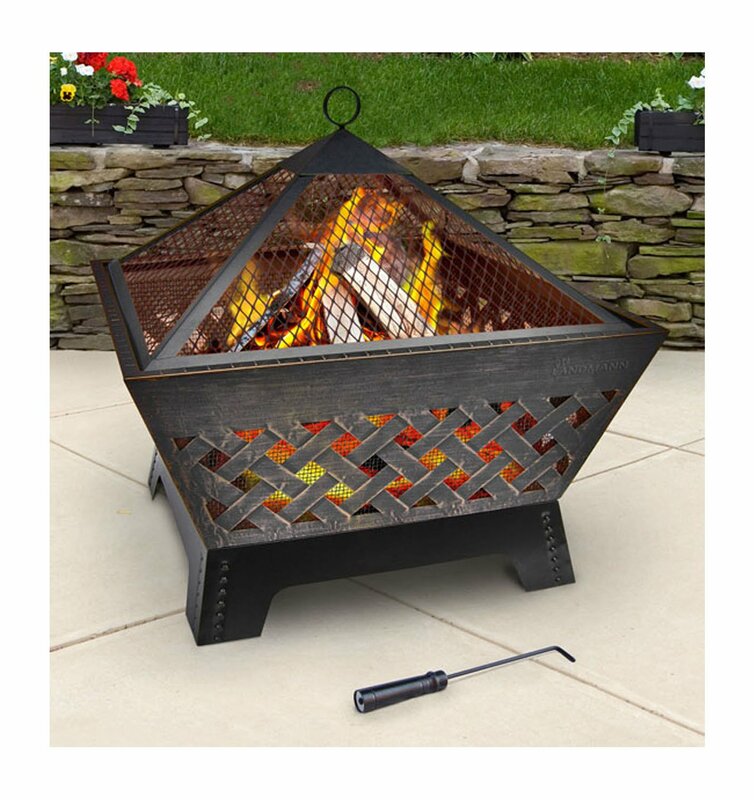 The Landmann 26464 23 Inch Savannah Garden Light Fire Pit has a bottom to help raise the logs or wood, wherein you need at least 5 pounds of sand. The bottom of the fire pit has no holes, which means that there will be no water drainage. The Landmann fire pit is not advisable to be used on a deck that is made out of wood. 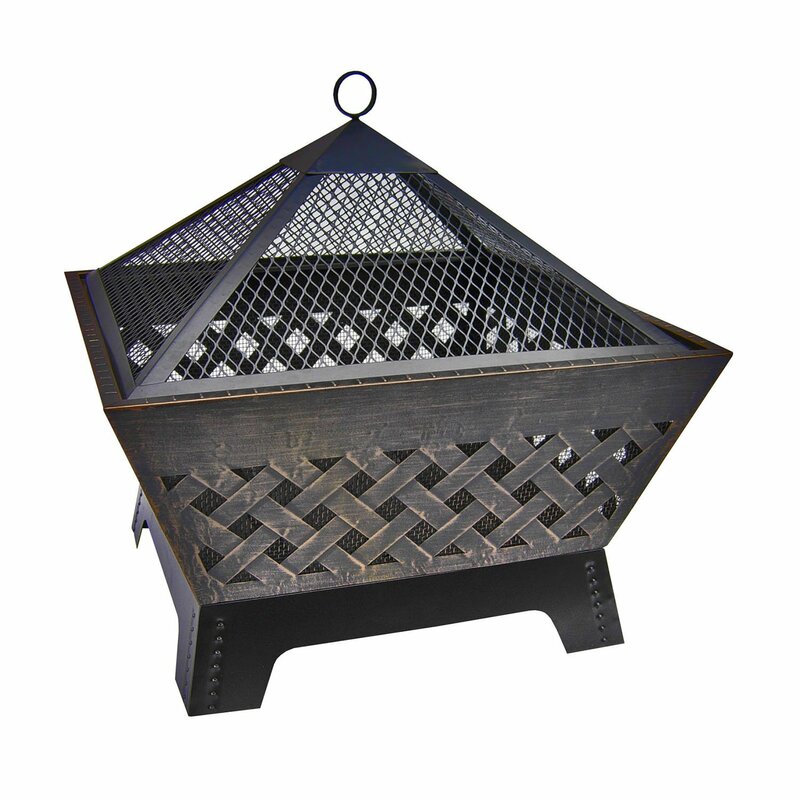 Landmann 25282 Barrone Fire Pit with Cover is a large 26 inches tapered square firebox. It has a pattern that is crosshatch with a detailing that is perfectly unique. The spark guard is heavy duty, which makes it a great fire pit. The construction of the pit is sturdy steel, for you to ensure that it will last for a long period. The weather cover and the poker cover will help it stay protected for an extended period. The Landmann 25282 Barrone Fire Pit with Cover also has a large screen to keep the embers entirely contained. The wood grate will ensure that there will be a perfect airflow with the fire. To make sure that the fire pit will stay protected from the corrosion, you may need to add at least 5 pounds of sand at the bottom of the fire bowl. When storing the fire pit, make sure to do it in a location that it dry. 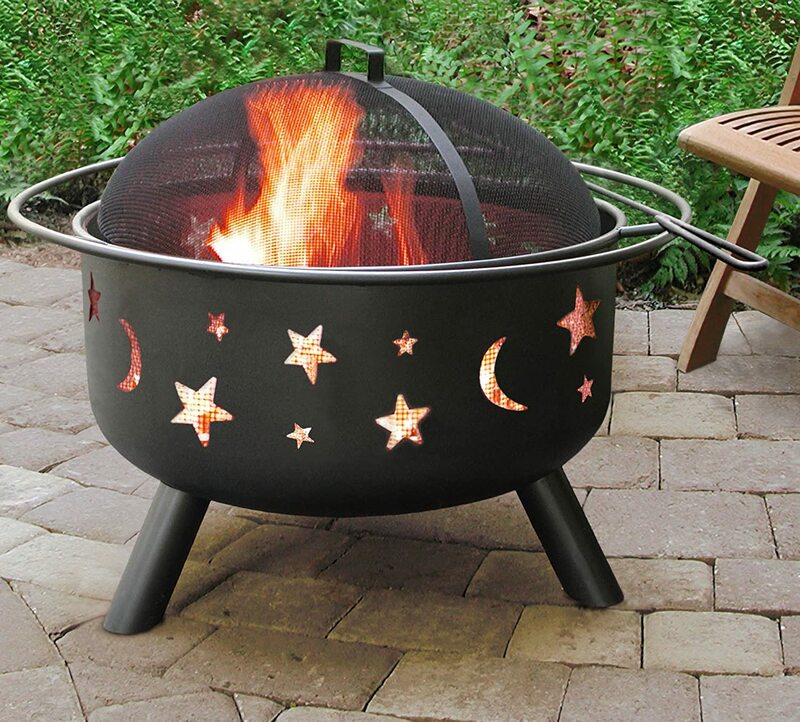 Landmann 28345 Big Sky Stars and Moons Fire Pit will let you relax under the sky full of stars while the fire is crackling deep in the bowl. Due to the full-size grate enamel that it has, it will let your grill your meals easily. The Landmann fire pit is constructed of steel which will ensure the durability. The round shape that it has will make you enjoy the warmth during the night since it has a 360-degree view. It also can accommodate different sizes of fires. 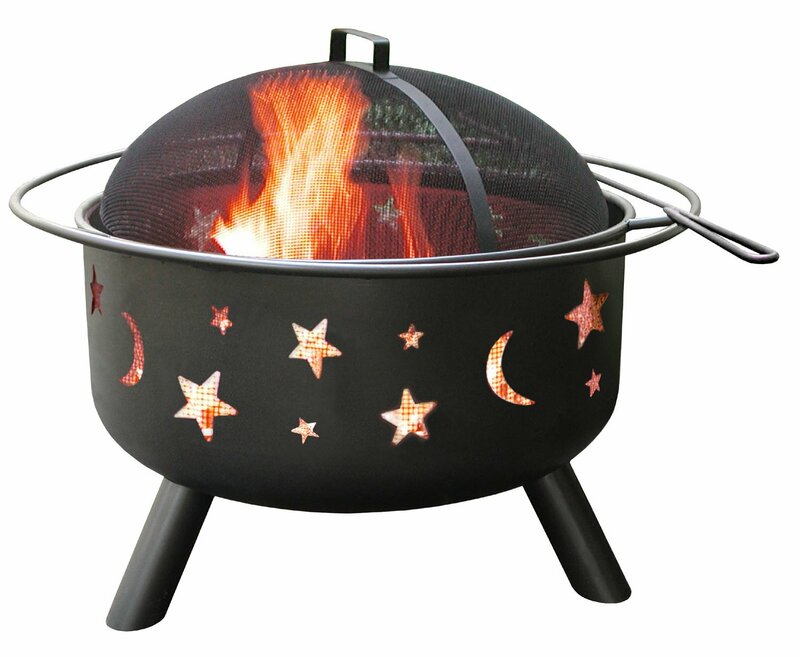 The Landmann 28345 Big Sky Stars and Moons Fire Pit will surely make your cooking fun. The 1-inch safety handle or ring will make transporting your fire pit easier to transport to the campground, beach or the park. To add appearance to your backyard, the legs are decoratively sculpted while the cutouts will create an appearance that is distinctive. AmazonBasics Natural Stone Fire Pit with Copper Accents will provide you with a great relaxation while enjoying the outdoors. The fire pit combines a durable construction and aesthetic beauty. It is also portable, which will make transporting the pit easier. Due to the naturally beautiful stone that it has, it catches the eye of everyone. It also has flared legs, which will complement the fire pit itself and add an elegance that is graceful. 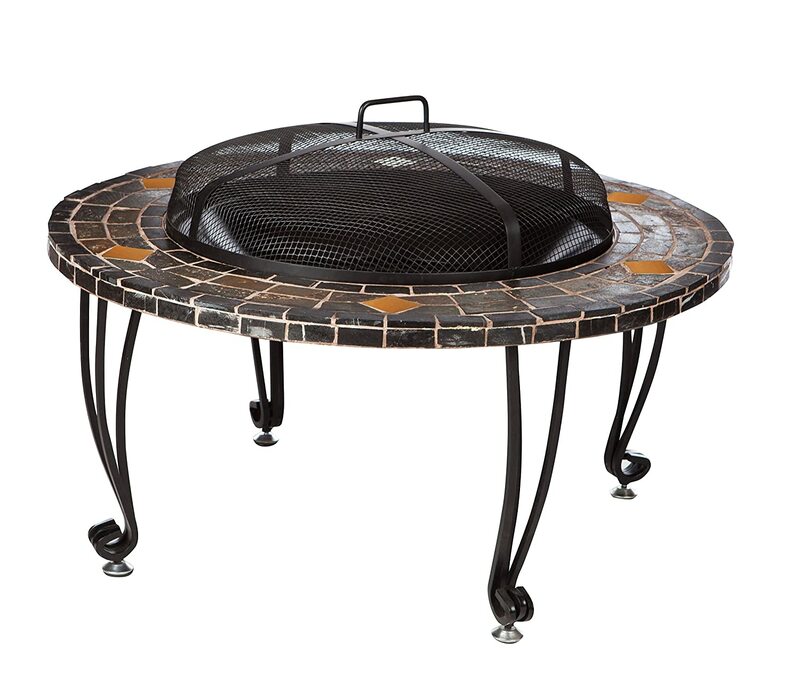 The AmazonBasics Natural Stone Fire Pit with Copper Accents has a grate log at the bottom, which slightly raises. This will then create a space and enable the air to flow freely. It also includes a fire screen that is dome in shape, which will offer a view of up to 360 degrees. The handle, on the other hand, will let you place the screen easily. Another good thing about this fire pit is that you can freely move it to your garden or your deck or wherever you need it. Sunnydaze Heavy Duty Diamond Campfire Ring has a functional and stylish design, which will add ambiance and warmth to every patio. You can easily set this up, which means that you can feel warm almost instantly. The steel construction is heavy duty, while the black paint high temperature is here for charm and resistance to heat. The cutout diamond design will let the fire inside to breathe and provide a view that is stunning freely. To ensure durability, it is constructed of high-quality steel. The Sunnydaze Heavy Duty Diamond Campfire Ring recommends that it should be placed 10 feet from a neighboring yard or structure. It would also be best to never place the ring under the wood deck, trees, or porch that are covered. When storing your Sunnydaze, it would be best to store it indoors, especially during the winter months or weather that is inclement. Lastly, it would be best to clean your fire pit regularly for it to last long. Above are the best fire pit available in the market today, which will surely help you decide which one to get. 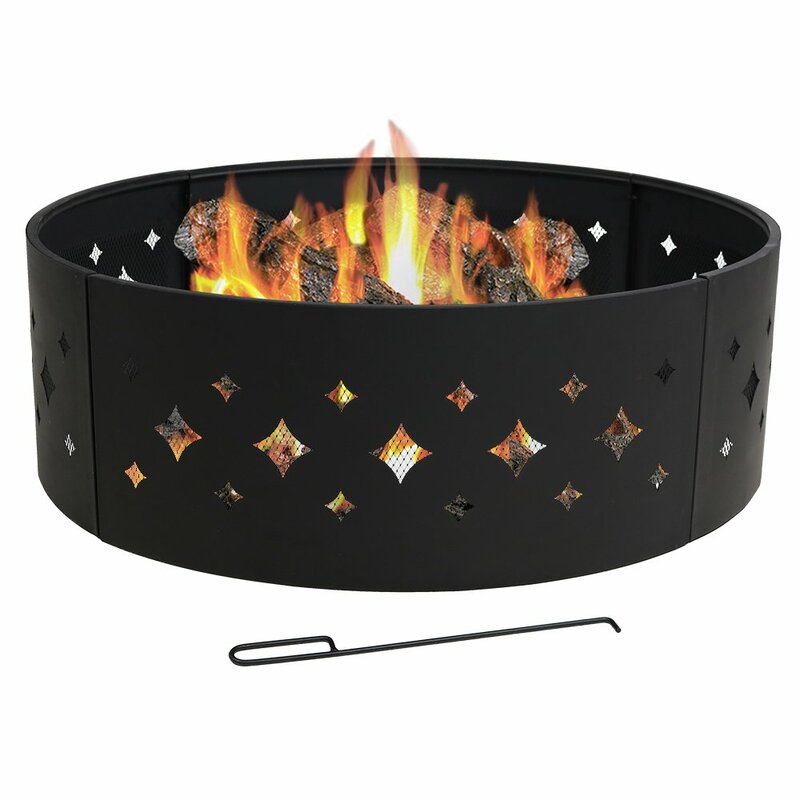 But for now, the winner for this review is the Landmann 26464 23 Inch Savanna﻿﻿h Garden Light Fire Pit. The reason behind this is because of its light weight, which can easily be transported, plus the ventilation that it can provide with the fire. Get to choose the best fire pit that will provide you with the needs that you have, for you to be able to keep you and your family warm during the colder months. Previous Post Differences That You Need to Know About Vermiculite vs. Perlite Next Post Why Are Orchid Leaves Turning Yellow?